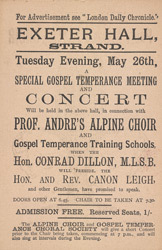 This is a leaflet advertising a concert by Professor Andre's Alpine Choir, which was organised by the British Association for the Promotion of Temperance. The Temperance movement was dedicated to encouraging moderation and fiscal prudence, particularly among the poor, and one of the pillars of its programme was the abstention from alcohol. It began in earnest in 1832, when industrialist Joseph Livesey and eight other notable people pledged to give up alcohol, encouraging others to follow their example. By the middle of the century, the Temperance movement was organising meetings, events and concerts such as this throughout Britain, showing people that they could enjoy themselves without drinking or spending time in public houses.